Few places in the world can rival this Old World city's blend of grace, beauty, history, and tradition. That's because Charleston, S.C. is lovingly preserved and unique among American destinations. In this grand old city, church bells still toll the hours and the rhythmic sounds of horse-drawn carriages join in the melody. Visitors can see the antebellum homes and plantations that echo a lifestyle of the old south--and feel and smell the salty sea breeze blowing into the city from beaches of the resort islands nearby. Shop at the popular open-air public market for native sweetgrass baskets, choose freshly-cut flowers at the Four Corners of Law (an intersection surrounded by government and judicial offices) and search antiques and more along historic King Street. Of course, be sure to taste the delicious seafood and other local delicacies at one of many renowned Charleston restaurants where many chefs specialize in flavorful lowcountry fare (See page 22). Once here, it's easy to understand why residents and visitors never want to leave. For an orientation to the area, visit the Charleston Visitor Center at 375 Meeting Street for a multi-sensory presentation called "Forever Charleston," and pick up lots of brochures and information, tour and attraction tickets and the regularly departing DASH Trolley. There are many urban treasures within walking distance of the Visitor Center, including the Nathanial Russell House, a fine example of Federal architecture built in 1808. It's one of many homes targeted by the city-saving work of the Preservation Society of Charleston and the Historic Charleston Foundation. Other nearby houses open to the public include the Edmondston-Alston House, the Heyward-Washington House, and the Aiken-Rhett House. The Edmondston-Alston House has a commanding view of Charleston's harbor and a treasure chest of antique family furnishings. The Heyward-Washington House was the home of prominent rice planter Daniel Heyward and once hosted George Washington. The Aiken-Rhett House provides one of the most complete looks at antebellum life in the south at one of Charleston's most palatial residences. Those who want to explore even more colorful Charleston history can visit: Charles Towne Landing, site of the area's original settlement; the Charleston Museum, America's oldest city museum; The Citadel, one of the last three military state colleges in the nation; or the world's largest naval and maritime museum at Mount Pleasant's Patriots Point, home of the famed World War II aircraft carrier, the Yorktown, and the newly-refurbished interactive Congressional Medal of Honor Museum. Art lovers will love the Gibbes Museum of Art, which is part of Charlestons Museum Mile. Opened in 1888, thanks to an endowment by wealthy Charleston merchant James S. Gibbes, the museum stands as a symbol of cultural leadership in Charleston, displaying an intriguing collection of American paintings, prints, and drawings from the 18th to the 20th century. The Gibbes is also the ending point for the popular South of Broad walking tour that visits points of interest from Pat Conroys ode to Charleston. The popular tour ends at historic Mills House Hotel down the street, which is also featured in the bestseller, along with the Gibbes and many other Charleston locations both north and south of Broad. For those with more time, Charleston's colorful charms can also be explored a bit further afield, where many plantations are open to visitors. On Ashley River Road, three colonial plantations interpret more than 250 years of rural life in the Lowcountry. Drayton Hall is preserved in almost original condition after more than 2 1/2 centuries. Considered one of the finest examples of colonial architecture in America, this historic house is the only plantation remaining on the Ashley River that survived the Civil War completely intact. Magnolia Plantation and Gardens features some of America's oldest and most colorful landscaped gardens. Along with the pre-Revolutionary War home, the famed gardens include a horticultural maze, an herb garden, and the Barbados Tropical Garden. Also located at Magnolia, Audubon Swamp Garden encompasses a unique 60-acre blackwater cypress swamp, crossed by bridges, dikes, and boardwalks. Middleton Place offers an exploration of an 18th century rice plantation. Laid out by Henry Middleton in 1741, the landscaped gardens are considered the oldest in America. Visitors can also explore the stableyards, complete with animals (including two new water buffalo) and period workers. The house tour provides an inside look at colonial life. For those who want a truly historic stay, its easy to spend the night at the architecturally unique Middleton Inn just down a pretty path. On the other side of Charleston, Boone Hall Plantation and Gardens begins with massive Spanish oaks planted in 1743 by Captain Thomas Boone. Original plantation buildings include nine 18th century slave cabins, built with bricks made on the plantation, and a gin house, used for processing cotton. 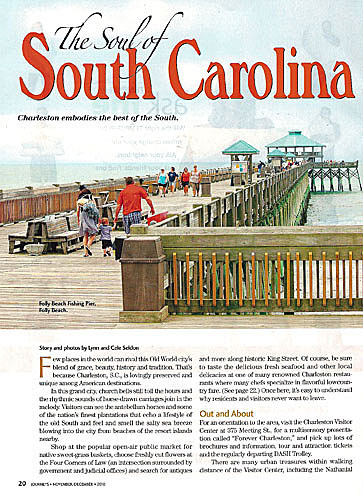 Of course, Charleston is also quite close to many excellent beaches and beach resorts. Just ten minutes from downtown Charleston, Folly Beach has maintained a small beach town atmosphere, but has modern resort amenities and the state's longest fishing pier. Other resort beach destinations include Edisto Island, Isle of Palms, Sullivans Island, Seabrook Island, and famed Kiawah Island, where golf and beach resort life reign. Nearby, there are several quaint towns that have become destinations in their own right. Located just across the Cooper River, the town of Mount Pleasant deserves the name, thanks to great seafood just off the boat at restaurants along Shem Creek, the historic village proper, and Patriots Point Naval & Maritime Museum (the huge aircraft carrier USS Yorktown is the big draw). To the north of Charleston just up Interstate 26, Summerville offers pretty architecture, a bustling downtown, and Woodlands Inn, a famed plantation-like resort and restaurant. Charleston offers varied accommodations ranging from modern hotels to quaint bed-and-breakfasts. For a city its size, the dining scene is truly remarkable, with a wide range of restaurants offering creative seafood, southern cooking, and other fare. Charleston is one of the nations premier dining cities. The possibilities for a great meal include: Neighborhood Dining Group (including renowned McCradys and chef Sean Brock, the tasty pirate-themed Buccaneer, and Queen Annes Revenge up on Daniel Island); Hospitality Management Group (Cypress, Magnolias, and Blossom); Trattoria Lucca (especially Chef Ken Vedrinskis family supper on Sundays); Circa 1886 (adjacent to Charming Inns lovely Wentworth Mansion); Peninsula Grill (featuring Robert Carters legendary cooking and the adjacent Planters Inn); Fish; and FIG. Maverick Southern Kitchens provides one-stop shopping (and eating) for those in town. The business has a popular store for foodies called Charleston Cooks! thats right on East Bay Street. In addition to kitchenware and much more for sale, its cooking school is located here too.